It was such a beautiful day yesterday, and I was lucky to spend part of it a a street fair in Greenwich Village. Crafts, handmade jewelry, art, vintage clothing, music and food--an endless array of things to browse and buy. Of course I spent the majority of my time taking pictures, but I did buy a couple of things--one of which is a necklace crocheted out of fine silver. Love. This guy had a lot of cool vintage stuff at his booth. Hmmm, I didn't buy anything from him either--just took this picture of my reflection. My friend Lisa was supposed to join me, but she had to bail out at the last minute. When I am with her, the cash flies out of my bag much more easily. Everything looks better and there are so many thing that I just have to have, if you know what I mean. It doesn't help that she is the queen of impulse buying--I can't even tell you how much stuff she bought at this fair last year. She's a good little shopper. But alas, I went by myself this year the the Hub stayed home and hung out with Willow and then met me later in the day for dinner. I stopped a fair bit of pedestrian traffic while I took these photos. And of course they were all looking at me like, "what is that crazy woman taking a picture of?" Eh, whatever, I am used to the looks by now. What did you do this weekend? I hope it was a good one. Linking up today with Sundays In My City and Your Sunday Best. I love using mirrors in my photography.....finding one of the street like would be fabulous...more market visits are required I think. These are a wonderful slice of city life. Inventive and such great composition. Love them! I love this idea! Looks like a great afternoon too :) That first shot is my favorite. I can't believed she yelled at you! These reflection shots are wonderful. I especially like the first one in b/w. Love all your reflection shots! What a great way to spend the day! I love these shots! It's as if you're a traveler from another world, taking in all the hustle and bustle around you! I'm a sucker for shiny 'stuff'. Ha! You are still young and thin and LIKE your reflection. Me - - - not so much - - - on either account. Its great to see a series of photo's telling a story. Brilliant work! I love the self-portraits!!! One year ago, my husband and I visited NYC for the first time. Our son is chef de cuisine at Five Leaves in Brooklyn, and he lives in Bushwick. 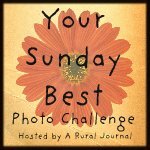 As a small town girl, I LOVED the photo possibilities, and I came home with hundreds of photo files. Next time, I'll determine the pace of the walking, though...and I'll have even more photos! ;-) Thank you for visiting my blog today. Fun reflection shots! That is a subject that I love to play with too. The city is so perfect for that.Your weekend sounds better than ours which included a funeral and a baby shower. LOVE those ones on 7th ave and the first one. I hate when people get angry at me for shooting! I liked the way it turned out though. Have a good week! Love all those reflections! That's such a cute idea to take your picture in all the mirrors. I love taking photos at the art fairs, but I'm finding more and more artists don't want photos taken. I understand, in a way, but darn it, I just want to share their work in my blog! What a fun idea to take your photo at restaurants. A totally unique idea. You day seems like it was so much fun. I can't remember the last time I got to spend some time enjoying a day out on my own. I am going to have to get someone to take care of the kids and just go because I always feel so happy when I do. It is like going on a date with yourself. Sounds like a great photo-walk/fleamarket "window shop". I really like the idea of restaurant selfies and my birthday is coming up... might have to start it up then. I love the reflection photos here. I always enjoy your blog!